In the United States poverty is associated with stress factors related to economic well-being, education, health and family and community. Low educational achievement is associated with low rates of marriage, race and absence of fathers. Out of the total 2.3 million people imprisoned in the United States, 1.34 million (or 58%) are blacks and Hispanics; they are imprisoned at nearly six times the rate of whites. Arguably, dealing with the problems of poverty with oppressive policing, and the resultant high levels of incarceration, only serves to exasperate social inequalities and levels of alienation. Fulcher refers to the United States Prison Industrial Complex (“PIC”) as “a profiteering system fueled by the economic interests of private corporations, federal and state correctional institutions, and politicians”. The US incarceration rate in 2013 was 6.899 million out of a total population of 316.5 million, the highest proportion in the world. The United States saw a rapid increase in the rate of incarceration from 1980 (see Figure 18) largely due to the introduction of mandatory tariffs for possession of drugs and rather than because of an increase in crime, for example a five-year mandatory sentence was imposed for selling five grams of crack cocaine. These policy changes disproportionately increased the numbers of blacks in prison, because racial-profiling targeted US blacks and particularly inner-city African American neighbourhoods which were seen as havens for drug users and sellers. Racial profiling which still appears to be part of police tactics in many US police forces was a factor in the riots in Ferguson and resulted in professionals, like Harvard University Professor Henry Louis Gates, being stopped and arrested as he attempted to enter his own home in Cambridge, Massachusetts. 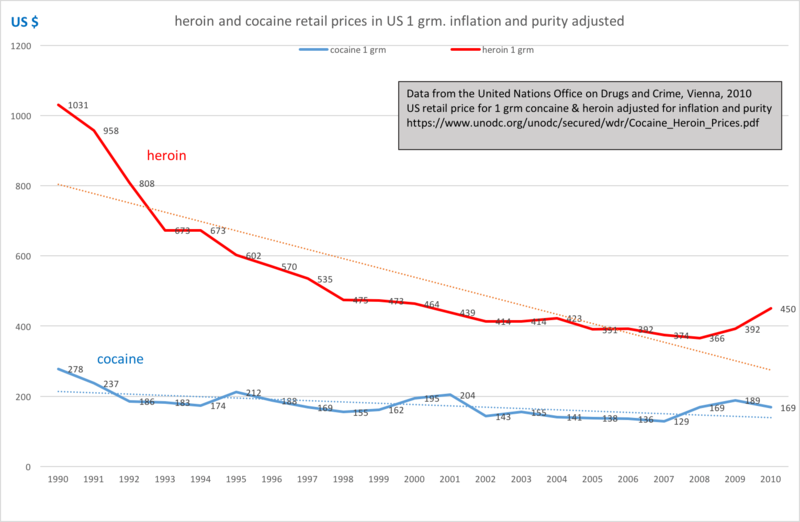 As Figure 1 clearly shows The “War on Drugs” which was pursued by President Regan and his successors has been wholly unsuccessful, prices for cocaine and heroin fell in the 20 years from 1990 and the trend lines for both drugs are steadily downward. According to the UNODC the US imported 196 tons of cocaine in 2008 with a value of $38 billion, in addition the UNODC stated that Canada and the United States imported 22 tons of heroin in 2008. The incarceration of a significant percentage of black males for drugs offences in the United States has been a complete misdirection of national resources. 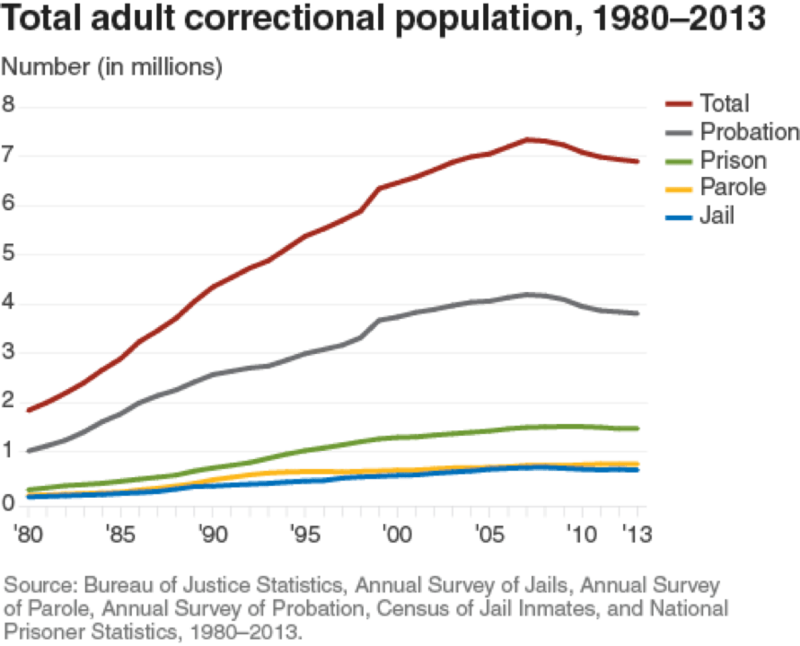 The growth in the US correctional population was also facilitated by the privatization of incarceration, with state correctional facilities run by for-profit prison management companies. Two corporations, GEO Group and Corrections Corporation of America (CCA) dominate the market are reported to lobby legislators in order to educate them and to secure contracts. It has been claimed that in the period 2011-13 these two companies spent at least $4,350,000 on lobbying the federal government, primarily to in relation to work on immigration-related contracts. However, at a time when US State and Federal budgets are under increasing pressure private prison operators may have to face a reduction in their revenue, given the questions about the value of incarceration on this scale. I have considered the question of incarceration in the United States and its role in “The War on Drugs” because it is an example of a dysfunctional government policy which continues to have serious social implications, increasing divisions within US society and exacerbating the situation of a substantial minority, namely blacks in the United States. Taken together with the failure to allocate the results of productivity increases and of growth in GDP across the entire population, this is another factor, that has increased imbalances within American society; creating additional fault lines and stresses within the US economy.